With more than 30.000 participants the “We’ll Come United! 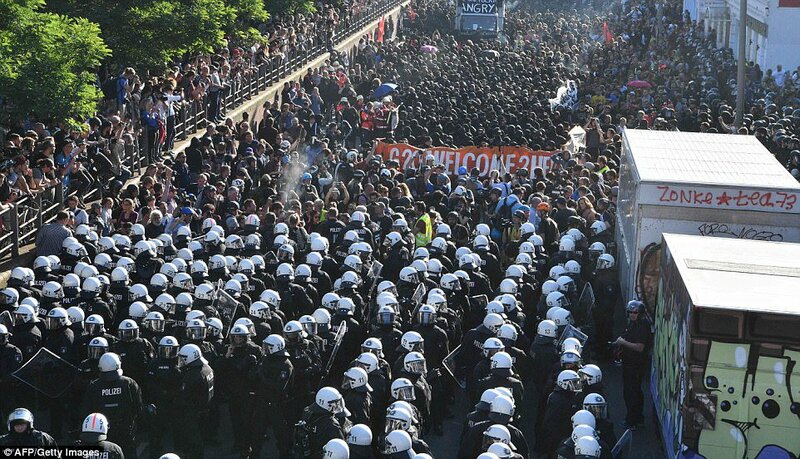 Anti-racist parade” in Hamburg last Saturday was probably the biggest antiracist demonstration which ever took place in Germany in such a mixed composition. 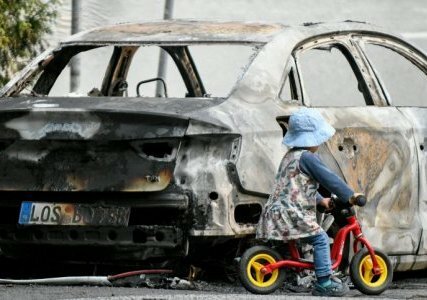 Hamburg September 29: Against deportation, exclusion and racist agitation – for freedom of movement and equal rights for all! We know already that September 29, 2018 will be the most beautiful day of the year. It will be our day. We are many, we are different and we struggle every day on our doorstep. We’ll all come together in September. We will come to Hamburg by car, train and bus. From villages and towns, from camps and shelters, from welcoming initiatives and aid organizations, from construction sites, schools and universities. With soundtrucks, performances, lyrics, music and carnival we’ll chase away the cold, the racism and the heartlessness from the streets of the city. Together we’ll draw a picture on the streets: the picture of our friendship, the picture of a diverse and fearless life in solidarity. When we move, the world moves! 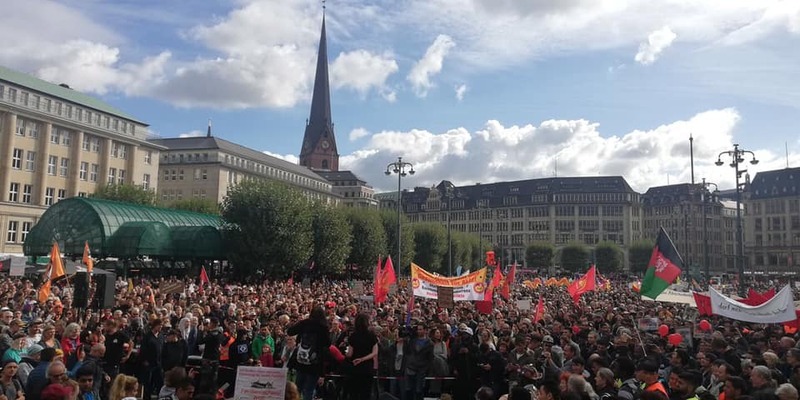 Continue reading Hamburg September 29: Against deportation, exclusion and racist agitation – for freedom of movement and equal rights for all! 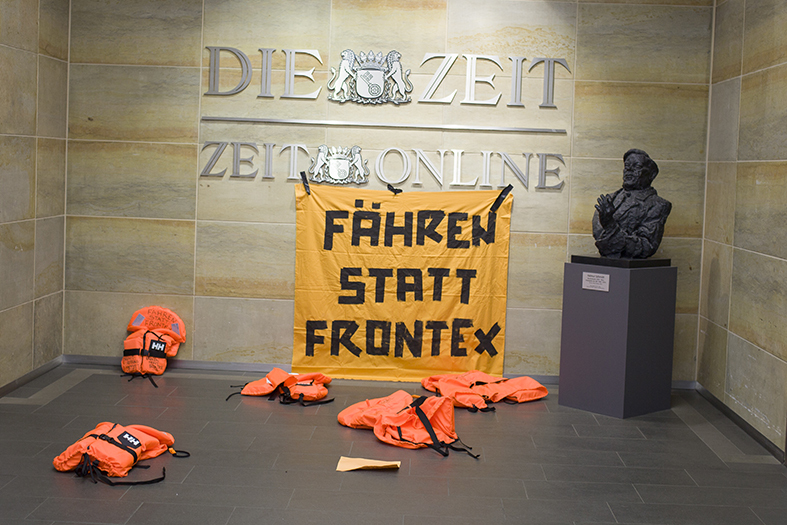 Activists congregate spontaneously in front of the Hamburg editorial office of German news outlet “Zeit”. + In speeches, they demanded an end to the criminalization of civilian sea rescue. The port of Hamburg is not only the city’s landmark, but also an international transshipment point where radioactive materials, energy commodities that are harmful to the climate, deadly arms, animal “products” and many other goods are handled. Therefore, it is also a junction where global social injustice, the destruction of the environment and exploitation come together. 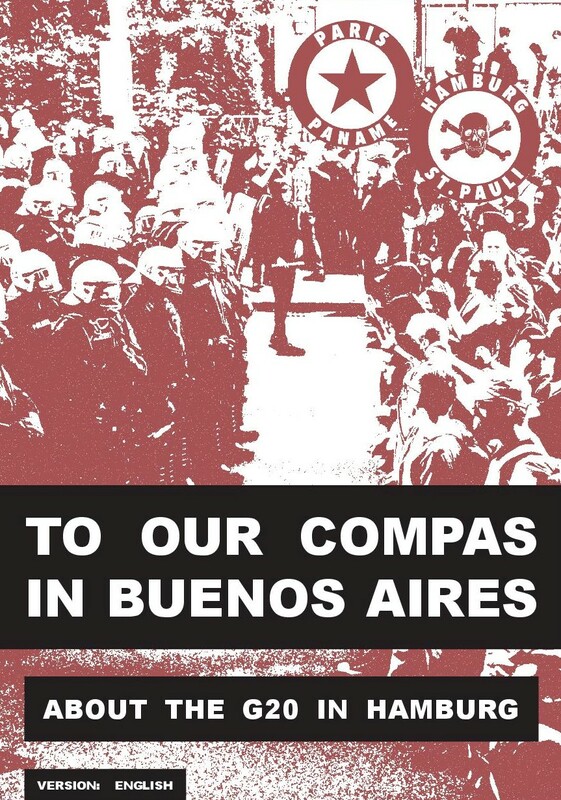 Let us unite and explore how to get active and oppose the destructive conditions of capitalism. Tuesday the 3rd of april, was the eighth day of Peike’s appeal procedure. The hearing began with announcements of the content of all now-planned trial days.The ninth day of Peike’s higher appeal took place on Thursday April 5. 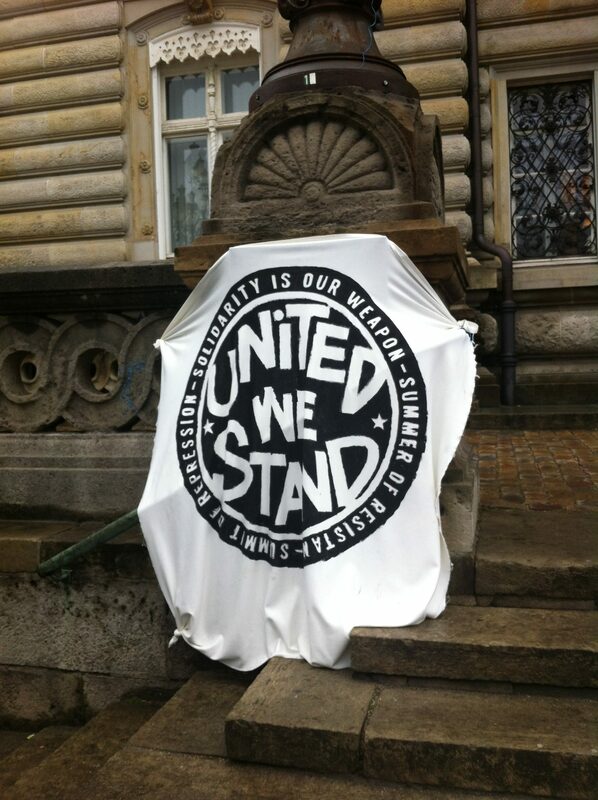 United We Stand were outside again with music and coffee, while inside the court room German as well as Dutch friends and comrades were present. 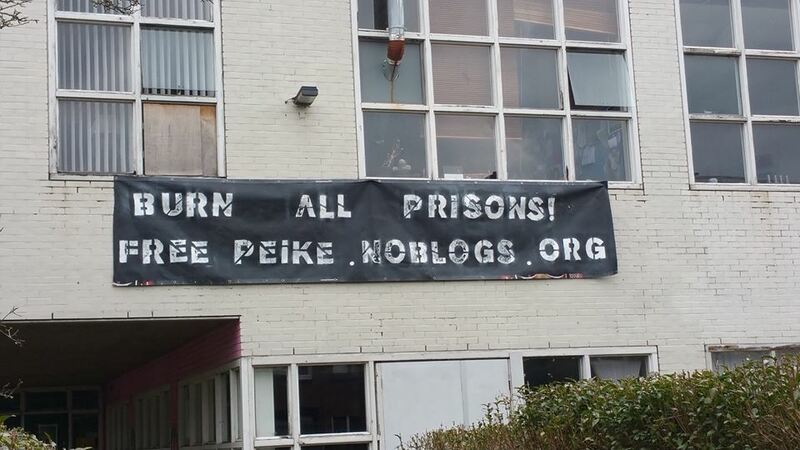 People can also join a bis from Amsterdam to Hamburg to the last planned court date of G20-prisoner Peike! Report of Day seven of Peike‘s appeal procedure at the court in Hamburg, Germany. Image above: Solidarity banner in bookstore “De Opstand” in The Haugue, Netherlands.